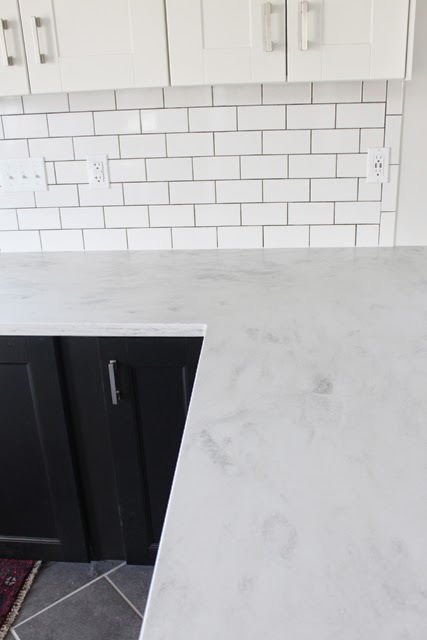 In my last couple of posts I showed a lot of our countertops and I realized I never did a follow-up post to the installation. 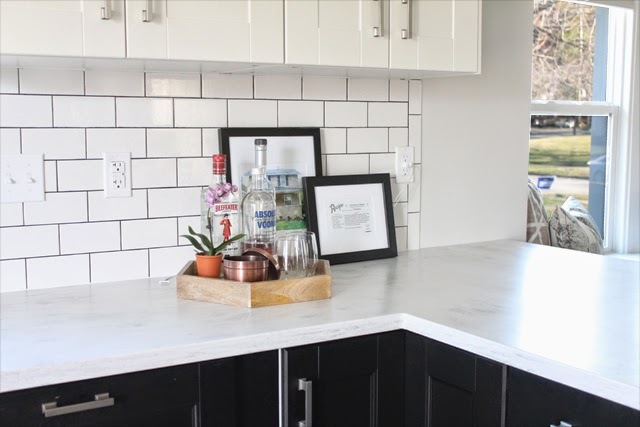 We've lived with them now for a couple months, so I can also share my opinions on solid surface in the kitchen, (since we installed solidsurface ourselves in the bathroom upstairs and have been living with that for a year and a half). 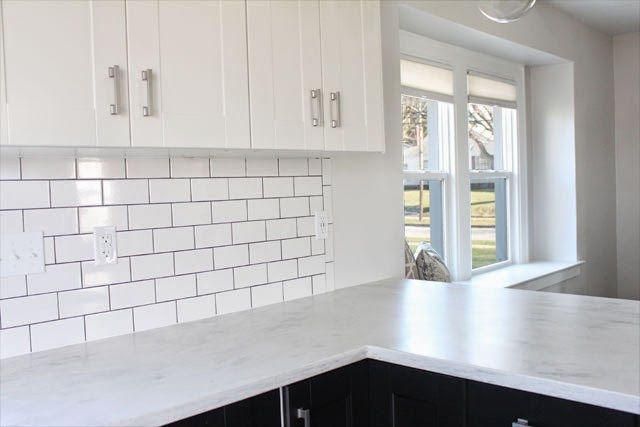 For a reminder, after switching from our original plan for granite, we went with Corian Rain Cloud from Home Depot. We couldn't be happier with our choice. To be perfectly honest though, we've never had so much counter space, so we're probably still in the adjustment period of so much space to use, regardless of what it's made of! I will say that I was a little concerned with the pattern, especially since it was a directional pattern. Knowing I would have 2 corner cuts I was worried that it would look very obvious. To add to my worries, the day of installation Mike was texting me throughout the process and informed me that the overhang for the peninsula would also have a seam since the width was wider than the sheets used. I was beyond nervous coming home that day. The base is white, with gray "veining", (not really sure what to call them), and some brownish spots as well. I was worried the brown would look weird, or dirty, but it's actually great for picking up the brown accents throughout the space, as well as hiding dirt, go figure! The corner seams are nearly invisiable, and since we have things in the corners, you really can't see them at all. The overhang seam is a little more noticeable, but only if you're looking for it. 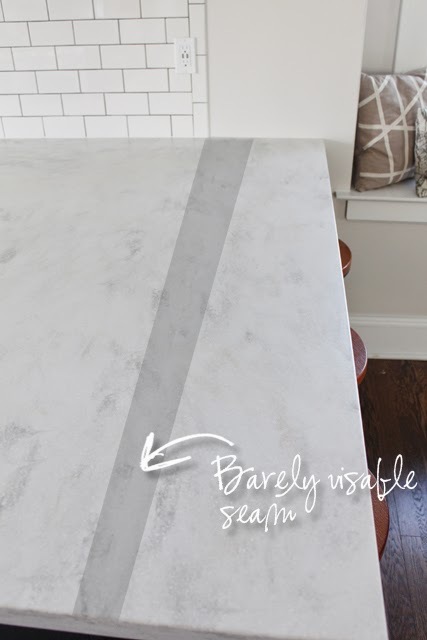 For the most part the gray veining blends, but there are a couple spots where the gray has a definite cut line exposing the seam. I've highlighted the seam and pointed to one of the obvious spots that shows the cut more prominently. While I made the final decision on the pattern, (Mike signed off obviously), Mike was in charge of all the small details. As I've mentioned before, he worked in a counter shop in high school, so he's aware of the more minute details that I didn't even know to address. 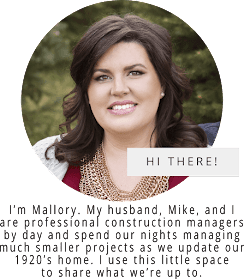 When he sent out our requirements for quotes, he knew to include the overhang information, eased edging, and the sink information of under-mounting. He was present for the templating, and the installation. I would have had no idea about the over hangs on the edge of the peninsula, or the other side where the counter is next to the door, but he knew these things and made sure to communicate to the installers. My only requirement was for the edge to be thick to give it a more "stone-like" look. The edges are 1 1/2" thick and look very substantial, and with the simple eased edge profile, it looks more like a slab of stone. The other concern was out of all the materials and patterns of solid surface, Rain Cloud was very soft. It's kind of velvety to the touch almost. I know this is weird, and I didn't even notice it until I did some research and found Lindsay from Little House Blog discussing Carrara Marble alternatives. When I touched all the samples, I could see exactly what she meant. 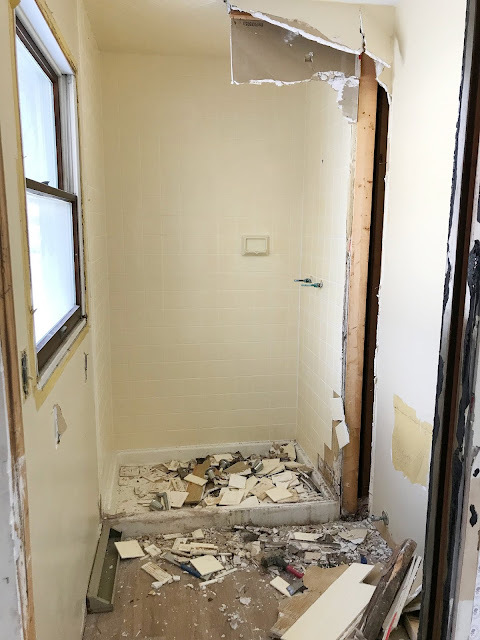 I was worried that it would never feel clean. We obviously went for it anyways, and I'm happy to report it I like the satin, almost velvet feel. It doesn't have a shiny finish that I think I would prefer, but it's very nice, and different. Being solid surface we haven't had any staining issues, or problems cleaning it. I have found that liquid spills leave shiny spots which I can see if the light hits it a certain way. For instance I recently found an area with a circle about 3 inches wide of very tiny shiny dots all around it. I wiped it up with my new favorite go-to counter spray, Mrs. Meyers, (in basil scent), but I couldn't for the life of me figure out where it came from, or how it was made. A couple days later I watched Mike pour some Sprite into a tumbler, and realized the tiny dots were the carbonation bubbles, which explained why there was a 3" spot in the middle where the glass sat. Not a big deal at all, but I've gotten used seeing little shiny spots from where water or some liquid has dried. I just wipe it up and move on. Obviously, a shiny surface like granite wouldn't show this, but on the flip side, a different material would have different maintenance issues of it's own! Overall we're really happy with the counters, and I'm not embarrassed to admit that I've been known to pet them from time to time. your kitchen is lovely! would you mind emailing me at lshildebrand(at)gmail.com and give me an approximate of how much it ended up costing you?? Our kitchen is 12'9" x 11' and the peninsula is 5'7" long, which leaves about 36" walkway between the edge of the counter and the counter depth fridge. The layout has worked great for us, and one of the best changes we made! Looks so awesome. Are those dimensions including your eat-in area with your kitchen table or just to the back of the peninsula? Our whole space is 16.5 x 11 but that includes our table area. I like how you have the stove and fridge on the other wall. And we are thinking of corian, too. It's so soft and homey feeling. Did you get the sink too? That does not include the eat-in area. I only have the dimensions of the kitchen off-hand (had to use the Ikea kitchen planner to look it up!). I would guess there is another 10'-12' to the 12'9" dimension. We essentially took two rooms with a wall dividing them and created one long space. There's a little wiggle room to move things around to get the same layout in your space though. Maybe move the dishwasher to the wall on the left of the sink, allowing the peninsula to move further into the room. Also, reducing the size of the sink, ours is a 33" stainless steel undermounted sink, (we didn't opt for the integrated sink - but my mom has one and she loves it!). We love our corian solid surface. It's so nice not to have to worry about staining, and I love how soft it feels! Thanks for the suggestions! We have such a wonky space...I may not be able to get it exactly how I want, but I can focus on a few good things! I love this and am highly considering ordering it! I want to make sure my edges turn out like yours, but don't see the "eased edge" option on the Home Depot site. Is that what it is called? Thanks Jess! Eased edging is similar to the rounded edge, Mike worked in a countertop shop in high school and that was the term they used and what he was familiar with. 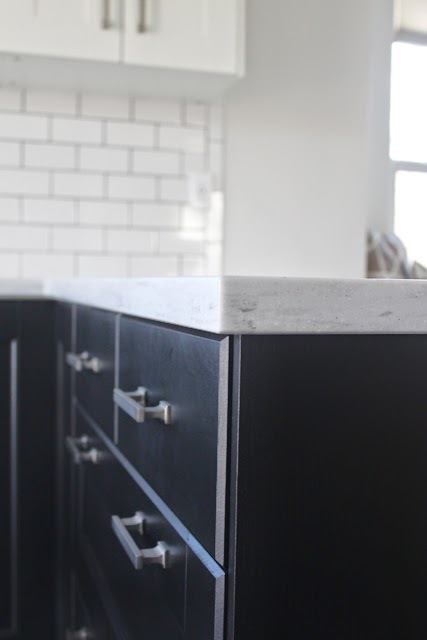 It's not as dramatic as a 1/4" rounded edge, but if you tell the associate (I used the estimator online, but we ordered in a store with an countertop associate), they'll understand what this means. I believe it's also called a straight or flat edge. They're interchangeable within the industry. 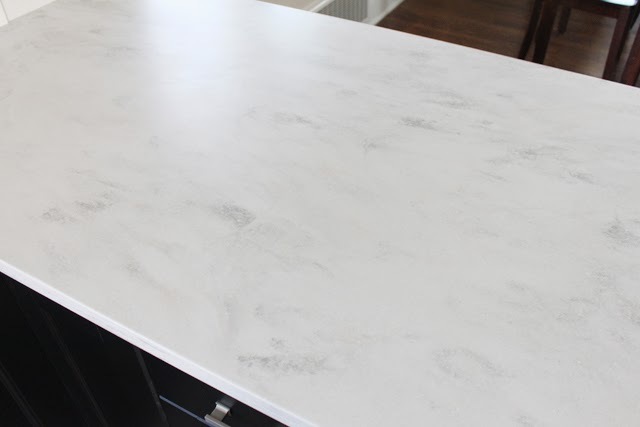 Hope this helps, and if you do go with the Corian Rain Cloud, you won't be sorry - two years later we still love it and have had no issues with staining or maintenance!